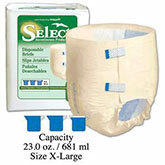 You are buying the Tranquility Select Brief Medium 32"-44" 2624 8/Bag, manufactured by Tranquility Incontinence Products. Tranquility is a leading manufacturer of incontinence products like briefs, underwear, liners, pads, and more. At ADW Diabetes, we offer a large selection of Tranquility products with excellent pricing and fast shipping. Disposable Briefs are designed for heavy incontinence. These adult diapers are value priced, but designed to perform "best in class." They are comfortable and provide excellent absorbent capacity. Briefs are color-coded by size and have a wetness indicator. Refastenable tape tabs. Lycra leg gathers for a secure fit. Briefs are color-coded by size and have a wetness indicator. Lycra leg gathers for a secure fit.